He came to drink, that much was clear. If he wasn’t willing to talk, and barely looked like he was listening, John Delaney at least left with every last carafe drained of its contents – and every last person drained of their energy. Eight hours, we spent there. Eight mind-numbing, spirit-crushing hours, a loan of a finite resource – time – that would never be repaid. And at the end of it, as Delaney shuffled away with the stooping, stiff-limbed gait of a man who tore both hamstrings in an ill-advised five-a-side game, he was, if nothing else, impeccably hydrated. His first glass of water was downed just after 10am as he assumed the hunchback position – head bowed, elbows on table, peering out at his inquisitors. The crevices under his eyes were deeper and darker than usual, tracing the stress that hadn’t lifted in 25 days since news of his 100-grand dig-out had come to light. He arrived wearing a Uefa coat, a not-so-subtle signal to us plebs that here was a man with connections and, by God, you best not forget it. He shook hands, whispered to his acolytes and cracked jokes, apparently unconcerned with the severity of his situation. We soon learned why, Delaney’s statement raised like a shield that protected him from questions about the loan or indeed his entire tenure as CEO. FAI President Donal Conway, meanwhile, was left to bat away shots away like the Liechtenstein goalkeeper, somehow keeping his side in the game. Wound as tight as piano wire, his hands shook as he read – and read – a statement that dragged on like a nil-all draw. He closed by listing a string of FAI underage projects, essentially asking the Committee if they’d please think of the children. Delaney, meanwhile, sank his fourth glass of water. During the break that followed, the artist formerly known as the CEO popped an Alka-Seltzer into his glass and let it fizz away as he spoke to his team, words now flowing with the microphones turned off. Funny that. Sitting behind him, like a concerned Dad watching his child take swim lessons, was his legal adviser. On a few occasions he slipped Delaney a handwritten note, like when Ruth Coppinger was prying into his new salary, a query which – surprise! – went unanswered. 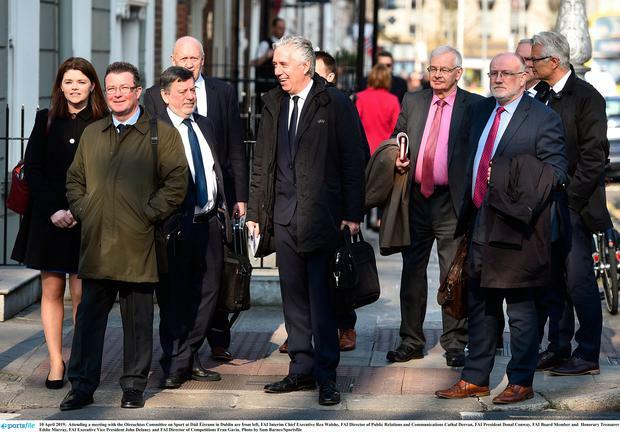 By then Delaney was on his sixth glass of water in two hours and, with his own supply exhausted, colleague Páraic Treanor poured him a glass from his own reserve. Such is the FAI way. With Conway continuing his verbal gymnastics, Delaney leaned on his elbows and jotted on his notebook like a child who was refusing to participate in class. His inquisitors ranged from the furious to the fan boys. TDs Ruth Coppinger, Robert Troy, Catherine Murphy and Imelda Munster all went in with their studs up; Mark Daly used his allotted time to virtue signal about gender equality then argue about his allotted time, while Michael Healy-Rae unleashed a soliloquy that sounded a lot like a love letter to Delaney. “You’re an embarrassment,” Coppinger told Healy-Rae. But she could have been speaking to the entire room: the TDs who thought a sports administrator under fire would be anything but opaque; the journalists who should have found something better to do; and the FAI folk, who, over eight exasperating hours, allowed us to peer through the windows at a desperately dysfunctional household.